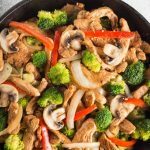 Keto Low Carb Chicken Stir Fry – this quick and easy weeknight recipe is perfect to feed the hungry hordes in your house! 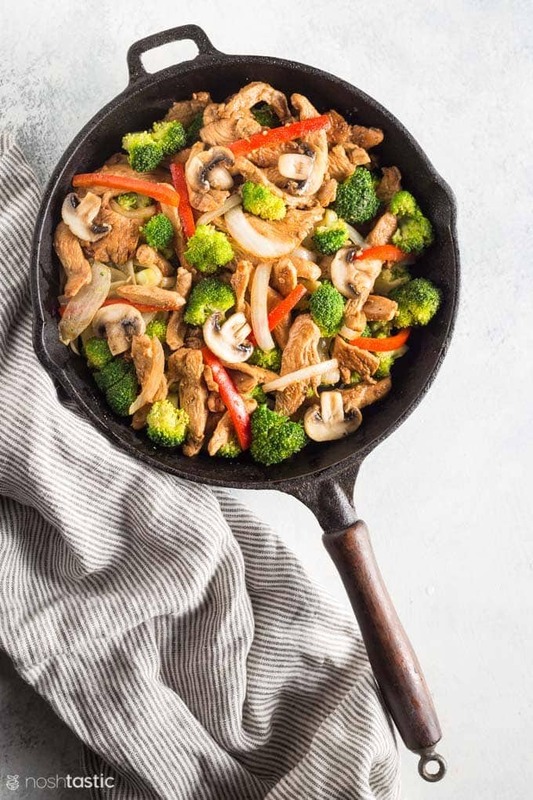 Made with everyday ingredients you already have in your pantry, you can throw this tasty stir fry together in next to no time. It clocks in at around 7g net carbs per serving so it’s a perfect chicken dinner for your low carb and Ketogenic diet. Don’t skip the marinating time, this is essential to getting the maximum flavor from this stir fry recipe. It helps to drain the marinade from the chicken before the chicken is cooked, you’ll get nicely browned chicken this way. If you simply cook it in the sauce it won’t be quite as nice. Prep all the vegetables and have everything ready to go before you start cooking. This recipe does cook quickly once you start so it’ll work much better if you can prep ahead. I like my vegetables barely cooked and with a little crunch so the cook time reflects that. Remember they are cooked twice in this recipe, first on their own in the skillet and then again when you add back the stir fry sauce so bear that in mind for the timing. 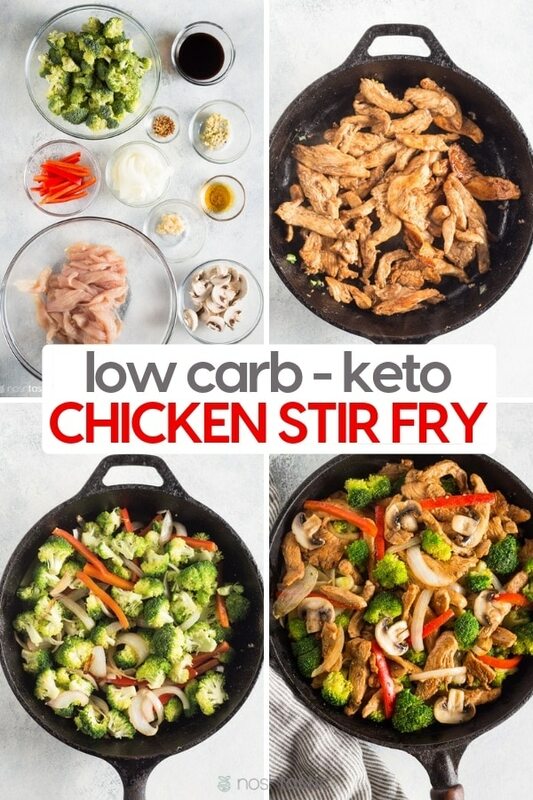 Quick and easy Keto Low Carb Chicken Stir Fry recipe. Marinate the chicken in the garlic, ginger, gluten free soy sauce, and apple cider vinegar in a bowl or ziplock and refrigerate for at least 30 minutes. 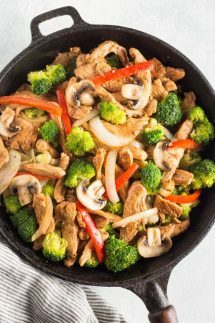 Heat the olive oil in a large wok and cook the onions for two minutes then add the broccoli and bell peppers and cook for a few more minutes until crisp tender, then remove the vegetables from the wok and add to a bowl with a foil cover to keep warm. 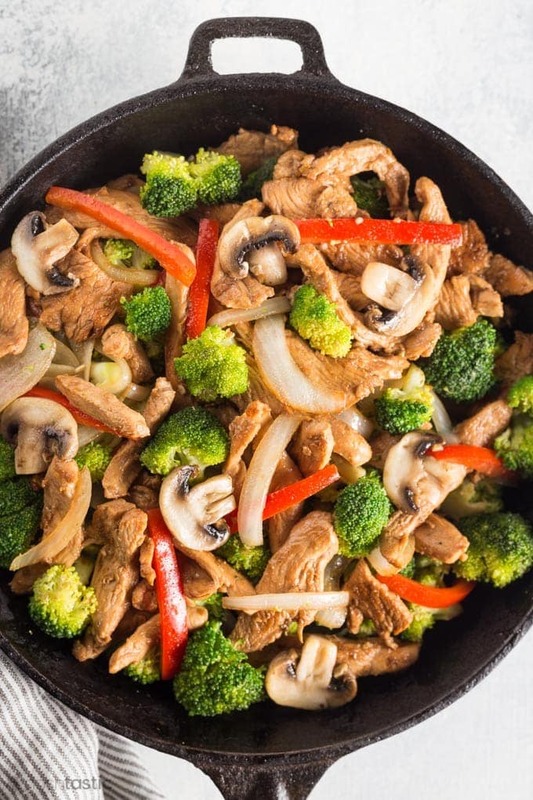 Drain the chicken from the marinade (keep the marinade) and add a little more oil to your wok and cook the chicken over a high heat for 3-4 minutes per side or until chicken pieces are fully cooked. Cook for a few minutes more until the mushrooms are cooked through, serve hot. 7g net carbs per serving, 4 servings per recipe. 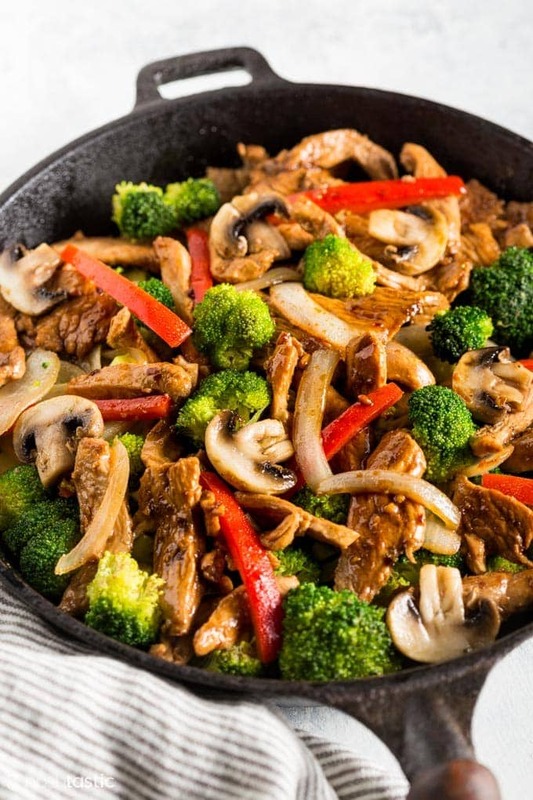 Can you add carrots to the broccoli if you don’t like onions,mushrooms,peppers? Sure! You can add any vegetables you prefer. Just bear in mind if you are concerned about counting carbohydrates that carrots are not considered low carb. You’d also need to slice them very thin and I’d cook them for a few minutes more before adding the broccoli as they take a little longer to cook. Just add more of the other veggies, or add in another low carb veggie you prefer. I can’t think of another veggie that’s similar to mushrooms. What is the remaining stir fry sauce? You are not to use left over marinade from raw to cook products. So, what sauce are you talking about. Thanks! Hi Michael, in step three you drain the chicken from the sauce and keep the sauce, in the last step the sauce is cooked with the mushrooms. So glad it’s working for you Pamela! Sheena, this was wonderful! Never knew that those flavors would come out as they did in this beautiful dish! Follow the recipe word for word!!! Hi Kate, I’m so glad you loved it!